"For decades, it's been a dream of mine to see Lester Dent's 1934 Doc Savage radio scripts collected in a single volume. Moonstone Books has exceeded my wildest expectations with this gorgeously-designed and handsomely illustrated book. Until someone unearths the transcription disks to this gem of Old-Time Radio, "Doc Savage: The Lost Radio Scripts of Lester Dent" is the only game in town." - Will Murray, writer, pulp fiction historian, and editor of "Doc Savage: The Lost Radio Scripts of Lester Dent"
Doc Savage is a physician, surgeon, scientist, adventurer, inventor, explorer, researcher, and musician - truly a renaissance man. From birth, a team of scientists, assembled by his father, trained his mind and body to near-superhuman abilities, giving him great strength and endurance, a photographic memory, mastery of the martial arts, and vast knowledge of the sciences. His creator, writer Lester Dent, described Doc as a mix of Sherlock Holmes' deductive abilities, Tarzan's outstanding physical abilities, Craig Kennedy's scientific education, and Abraham Lincoln's goodness. A man of adventure himself, Dent brought Doc Savage to life in the 1930s in a series of popular pulp fiction novels for Street and Smith Publications - novels that, even today, continue to thrill and entertain an ever-increasing number of fans. In the early 1930s, with the growing success of The Shadow on radio, it was only natural that Doc Savage would be considered a prime candidate for the broadcast medium. Lester Dent certainly thought so - and, in fact, when he signed his first long-term contract with Street and Smith to write Doc's pulp adventures, he made certain to assign himself the ancillary rights to alternate versions of the character, including both radio and motion pictures. In 1934, Dent contracted to write a weekly fifteen-minute Doc Savage radio series to be sponsored by Cystex, "that remarkable doctor's prescription for the relief of kidney disorders", or so the sponsor advertised on the broadcasts. Aired on a weekly basis between February and August of that year, the series proved somewhat popular - but, unfortunately, not popular enough to warrant producing more than the initial twenty-four episode run. Part of the problem, it was felt, was that Doc's pulp adventures were too detailed, too intense, and too heavily populated to be captured in a quarter-hour format - particularly one that wasn't a serial but, instead, featured a complete story each week. What's more, the limited budgets of early 1930s radio didn't allow many actors to appear in each script, reducing Doc's Fabulous Five down to one, Monk Mayfair, who became the Man of Bronze's burly sidekick on the air. Twenty-four weeks after it began, the Doc Savage radio series ended and was soon forgotten, relegated to the annals of misbegotten opportunities. No recordings were known to survive and, until the early 1980s, it was assumed that the scripts, too - all new and original stories, written especially for radio - were lost to the ages. 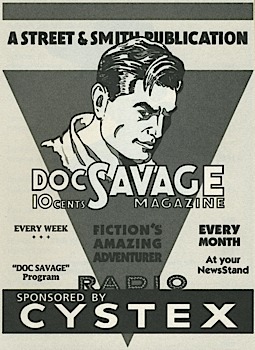 Then, by chance, writer Will Murray happened to be going through Lester Dent's files and discovered that Dent had indeed kept carbon copies of his scripts for the radio version of "Doc Savage" and, what's more, that he had also retained copies of scripts for a few shows that were never broadcast - a total of twenty-nine original Doc Savage adventures that no one had seen, heard, or read in over forty years! Now, Moonstone Books is proud to announce the first complete compilation of all of these exciting and largely unknown radio adventures, bringing together the long-lost tales of The Man of Bronze in one single volume! Written by Lester Dent and edited by and including a fascinating introduction by Will Murray, this 352 page volume also contains beautiful interior illustrations by artist Tom Roberts created especially for this release and an iconic cover painting by Bantam artist Bob Larkin. It's truly an item that's a "must have" for the personal library of any Doc Savage enthusiast - and what a great gift to give the pulp fiction lover in your family! This book provides a unique way to have additional Doc Savage stories. Too bad the actual audio is not available. But, it lets you understand better how old time radio worked. As I said deal of the year I am very pleased with the purchase and service.